Saturday 12:00 pm. - 2:50 pm. Grilled slice marinated chicken breast topped on assortments of fresh seasonal vegetables with house peanut sauce and sweet & sour sauce served with Crab Rangoon(2). Deep-fried soft shell crab tempura topped with Thai sweet chilli sauce and crispy basil leaves on a bed of lettuce. Served with Summer roll(1), and steamed jasmine rice. Combination of shrimp and chicken with mango chunks, egg red peppers, snow peas, onions, green peas,carrots, baby corns, tomatoes, raisin and a touch of curry powder. Served with crispy Tree top rolls(2). The following are served with Jasmine Rice (substitutes to Brown rice add $1.00) and Available for vegetarian. Steamed tofu topped with bean sprouts, scallions, snow peas and red peppers in soy ginger sauce. Tender pork pan fried with string beans, baby corns, eggplants, mushrooms, fresh basil leaves, green and red peppers and peppercorn in Thai spices curry sauce. (with coconut milk) . Sautéed tender slices of beef with assorted vegetables with a delicious southern Thai country sauce. Sautéed sliced beef sirloin with baby corns, mushrooms, tomatoes and green peppers in mild pineapple sauce. Tender squid sautéed with fresh minced hot peppers, fresh basil leaves, mushrooms, onions, green and red peppers. Shrimps sautéed with roasted cashew nuts, onions, dried chili, mushrooms, snow peas, red pepper and scallions in a delicious honey lemon sauce. Boneless roast Duck sautéed in Thai Choo chee curry and vegetables. Main course from the south of Thailand. 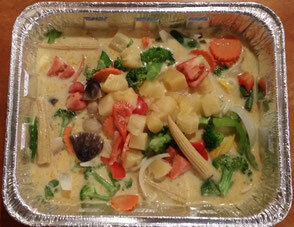 A variety of seafood sautéed with assorted vegetables in house curry sauce. Combination of shrimp and chicken, onion, tomatoes, yellow squash, red pepper, baby corns, fresh mango and mushroom in house yellow curry. Grilled slice breast chicken marinated in garlic, lemon grass, soy sauce topped on sautéed string bean, baby corn, carrot, snow pea, mushroom topping with crispy basil leaves. Fried light batter crispy breast chicken sauteed with fresh minced hot peppers, basil, onions, mushroom, broccoli, green and red peppers. Sautéed with assorted colorful vegetables in light brown sauce. Sautéed with Broccoli, Carrot and mushrooms in light oyster sauce. Sautéed with sweet & sour sauce and assorted vegetables. Sautéed with black mushrooms, baby corn, onions, red peppers, scallions and fresh ginger in house special sauce. 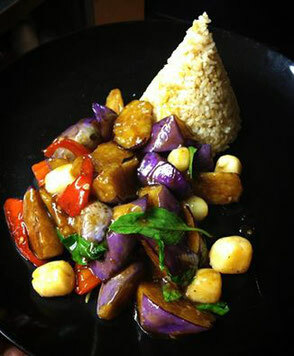 Sautéed with roasted cashew nuts, onions, mushrooms, snow peas, pineapple and scallions in a delicious honey lemon sauce. snow pea, green pea, and basil leave. red and green pepper topped with pine nuts. and scallions topped with ground peanuts and lime wedge.. Typical Bangkok’s dish. Soft wide fresh rice noodles pan fried with chicken, shrimp, onion, basil leaves, eggs and Chinese broccoli . Typical Bangkok’s dish. Soft wide fresh rice noodles pan fried with egg, onion, basil leaves and Chinese broccoli . Pan fried with chicken, shrimp, onion, basil leaves eggs and broccoli. Country style rice noodle soup is accented with aromatic basil, bean sprouts, cilantro and tender beef. 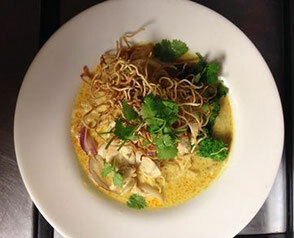 Thai style rice noodle soup with Chicken, bean spouts, cilantro. Favorite hot and sour rice noodle soup with shrimp, squid, bean sprouts, cilantro in chef’s special Tom Yum soup. Vermicelli, roasted duck with bean spouts, cilantro and Chinese broccoli. Rice noodle with tender beef, bean spouts and cilantro in yellow curry. 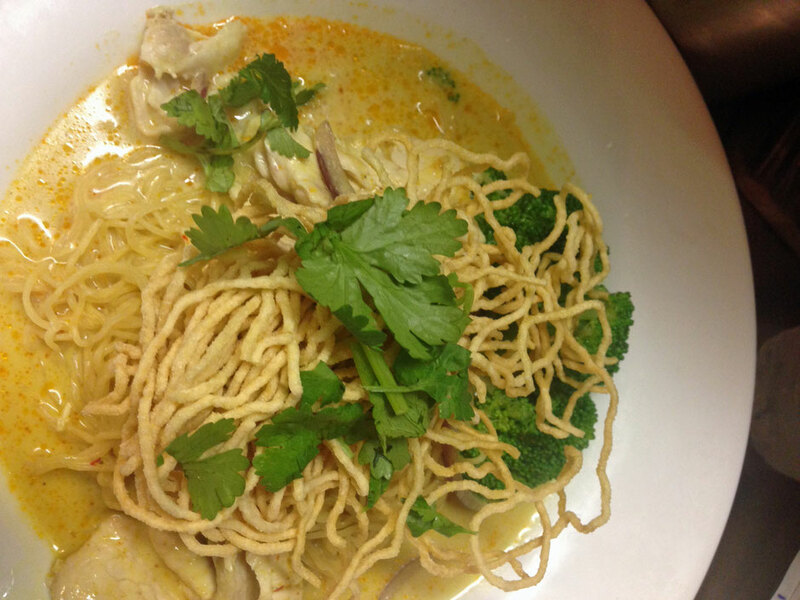 Favorite dish from Northern part of Thailand, boiled fine egg noodles, chicken, red onions, cilantro and broccoli in Thai curry sauce. Shrimp, chicken, egg, snow peas, green peas, carrot, raisin, onions, baby corns, red peppers, scallions and tomatoes. Fried rice with egg, raisin and assorted fresh vegetables. The popular and delicious pan-fried rice with chicken, onion, hot peppers, basil leaves, geeen and red peppers. Shrimp, red onions, mushrooms, cucumber with a touch of red curry topped with BBQ. Chicken and cilantro. babycorns, carrot and green peas. Deep fried sliced salmon until perfection sauteed with straw mushroom, snow pea, red pepper, green pepper, carrot, yellow squash, string bean, baby corn, basil leave in house spice basil sauce served with sticky rice. To be Boiled with broccoli, green bean, carrot and seasonal vegetables served with house's special peanut sauce and steamed jasmine rice. Brown Rice and Sticky Rice are available!! fresh bean sprouts and lime. with chicken, shrimp, onion, basil leaves, eggs and Thai broccoli. Shrimp, chicken, snow peas, green peas, eggs, onions, raisin and tomatoes. mushroom topping with crispy basil leaves served with jasmin rice. Sauteed assorted fresh vegetables with oyster sauce. Stir-fried rice with fresh green vegetables and egg.